The Walking Library is an ongoing creative research project created by Misha Myers and Dee Heddon, that seeks to bring together walking and books – walking, reading, reflecting, writing… Each Walking Library we create responds to – is specific to – the context of its walking. Each walk changes the shape – the content and the actions – of the library. In 1794, John Hucks and Coleridge walked to North Wales. Hucks carried with him the poems of Thomas Churchyard. In 1802, Coleridge walked through Cumberland, carrying with him ‘a shirt, a cravat, two pairs of stockings, tea, sugar, pens and paper, his night-cap, and a book of German poetry wrapped in green oilskin.’ He apparently read the Book of Revelations in Buttermere. In 1818, Keats travelled the Lake District and up to Scotland with his friend Charles Brown. Keats’ carried Dante’s Divine Comedy, Brown the works of Milton. In 1867, on a thousand mile walk to the gulf, John Muir carried a copy of Robert Burns’ poetry, Milton’s Paradise Lost, William Wood’s Botany, and a small New Testament. 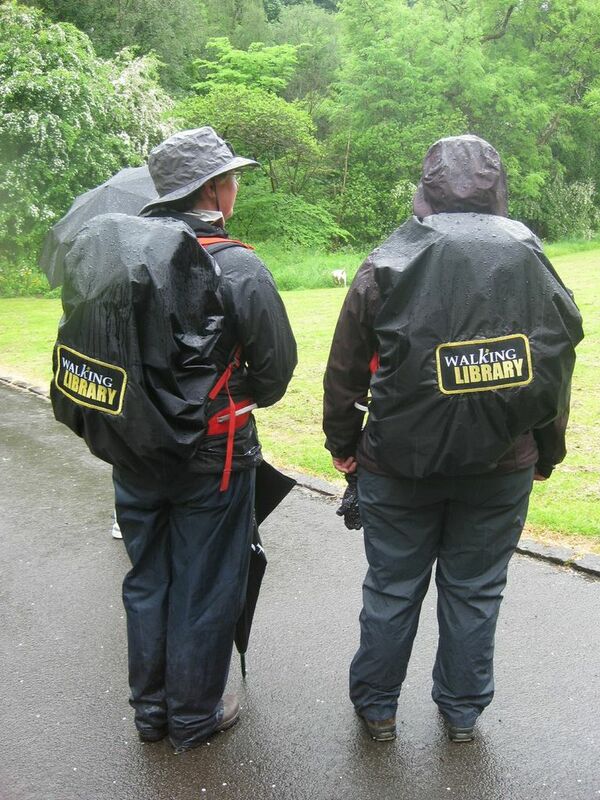 The Walking Library, bringing together walking and reading, follows in the footsteps of a long history. The Walking Library took its first walk as part of the Sideways Festival 2012, a peripatetic arts festival that walked 333km from the western to the eastern border of Belgium ‘in the open’ and ‘on the go’, which aimed to connect ecology and culture through using the ‘slow ways’ or ‘slow paths’ of Flanders. For that journey, we asked a general question: ‘what book would you take on a walk?’ In April 2013, Dee took the Walking Library to Athens, Ohio, creating a walk called ‘From Ohio to Scotland and Back Again’, carrying books about Scotland and reciting/re-siting them in Ohio. In June 2013 the Walking Library walked near Glasgow, gathering and carrying hand-picked books to be donated to Bothan Suibhne, a bothy built on the island Eigg. Next, in Palo Alto, California, we created a Nightwalking Library, and walked from dusk to dawn, visiting the sleeping libraries of the city and Stanford University, carrying books about walking and time. This walk considered the various temporalities of walking – the rhythms of walking, the relationship of time to the walker’s experience – duration, time-space and slow reading. In July, Dee created a Walking Library for the Royal Scottish Geographical Society’s “Stories in the Land: Bedrock Walk”. For Bedrock Walk, a small group of people walked together from Dalwhinnie to Glen Nevis, following the Thieves Road – a route used for centuries by cattle thieves making their way south and west from the Central Highlands of Scotland. The Walking Library created two books filled with poems, stories and accounts of rocks, geology, walking and thieves, to be carried and shared along the route, A third book was created after the walk, capturing the group’s various experiences. In November 2013, Dee also created a Walking Library for Tree Week – the library filled with books about forests and trees; book leaves, tree leaves. As with all good libraries, the Walking Library facilitates extension activities – including a peripatetic reading group allowing engagement with and reflection on the Walking Library’s content, and some sketching with words or images. Where a book is suggested or donated to the library, the reason why the book has been donated is also left in the library book card. These cards, each with their personal story, collectively form an autobibliography. Walking with a library of books, we wonder what these literary companions add to the journey; how collective reading and writing in situ affects the experience of the journey, the landscape and the experience of walking; how journeying and the landscape affects the experience of reading; how reading affects the experience of writing; and how a walk, as a space of knowledge production, is written and read. Through walking, reading and writing together we create an immersive and moving space, a kind of mobile laboratory. For more information on what it’s all about, watch this video on the project created as part of My Bookcase.